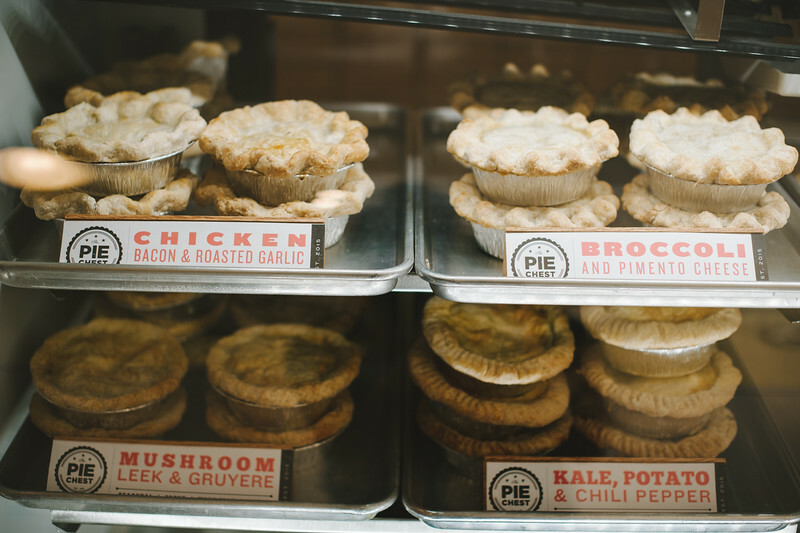 The Pie Chest opened its door on the morning of Saturday, March 14 (Pi Day), its glass pastry cases stocked with around 140 pies. By early afternoon, the cases were empty. Every last slice of pie had been sold. The Pie Chest sold out of pie on its second day, and again on the third. The shop sold out often in its first few weeks, and Rachel Pennington, the baker who manages the shop, was worried that she and her small staff wouldn’t be able to keep up with the demand. The pie is THAT good. The funny thing is, Pennington never intended to become a baker. She came to the Charlottesville area with a double master’s degree from Princeton University in hand, ready to study for the GRE and apply to theology and religion Ph.D. programs. Pennington thought she would become a professor, or work in the nonprofit sector. In spring 2012, while looking on Craigslist for a side job to support her as she studied, Pennington noticed an ad for a baker at a local restaurant. “There was an ad for a ‘Part-Time Skilled Baker.’ That was literally the headline, and I had never baked in a restaurant. I still to this day don’t know why I answered that ad, because I was not qualified,” she says, laughing. Tired of spending money on bad cookies and dry cakes– Pennington considers her own tastes to be very specific– she had been baking avidly at home. She answered that ad and brought a homemade peanut butter pie to an interview at the Whiskey Jar. 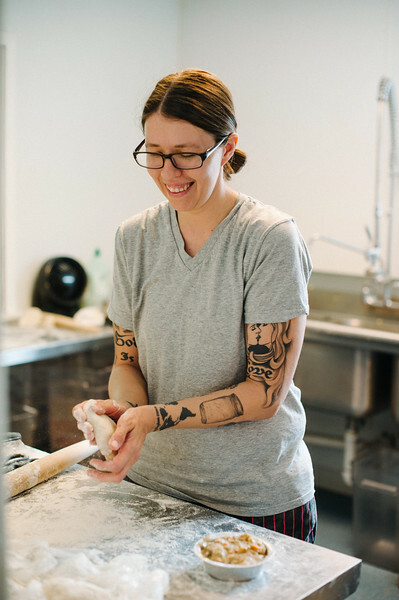 Within a few months, Pennington was baking full time at “the Jar,” as she calls it, and her desserts were making a splash. Her peach cobbler was featured in The Boston Globe in September 2013, in Southern Living, and in various other magazines. She is now most certainly qualified to run Charlottesville’s only brick-and-mortar pie shop (the shop is co-owned by Will Richey, who also owns Whiskey Jar, Alley Light and Revolutionary Soup), but she still talks about the accolades—and the Pie Chest—like she can’t believe her good luck. But Pennington is doing this, and it’s been a success so far. 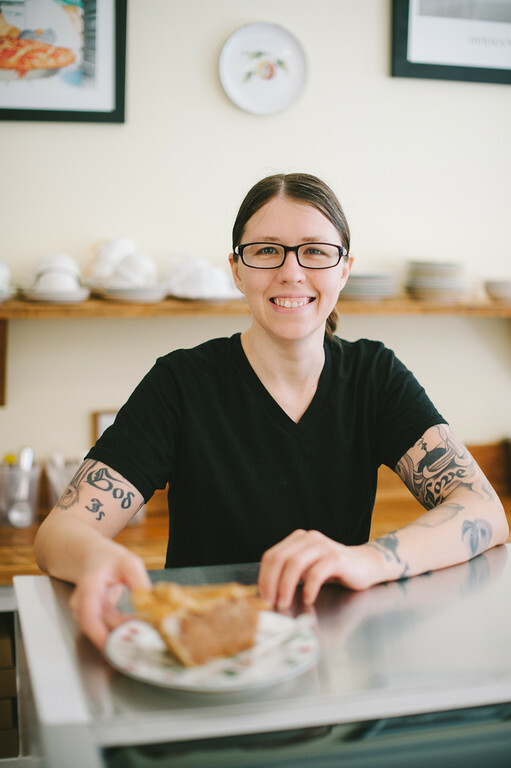 Not only does she have the culinary skill, she has the soul to run a shop that has filled a mostly empty niche in the Charlottesville food scene. 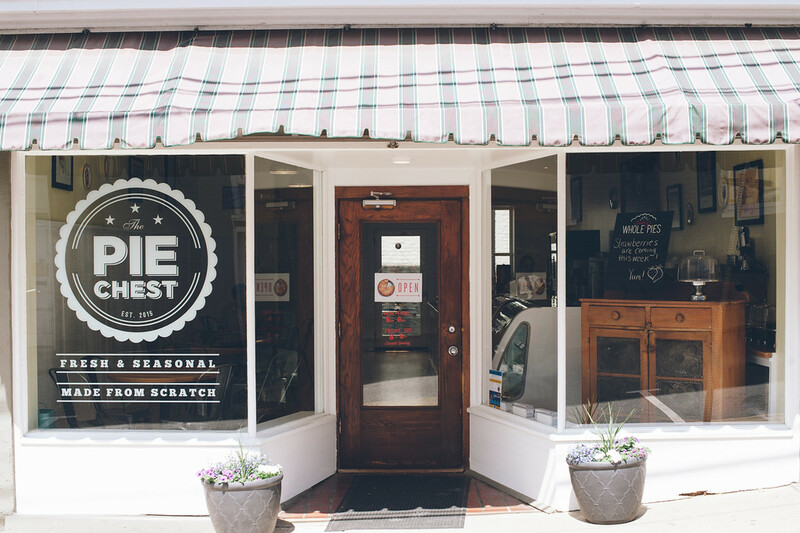 The Pie Chest has three values, printed in white letters on the storefront windows: Fresh, Seasonal, Made from Scratch. The philosophy behind the Pie Chest, Pennington says, “is to make good food, and we wanted to do things the way our grandmothers did, and, ideally, from scratch.” When she makes a strawberry pie, she thinks of the strawberry patch in her grandmother’s back yard, how in the summers, they would go out and pick together, then hull the berries and dip them in sugar to eat. 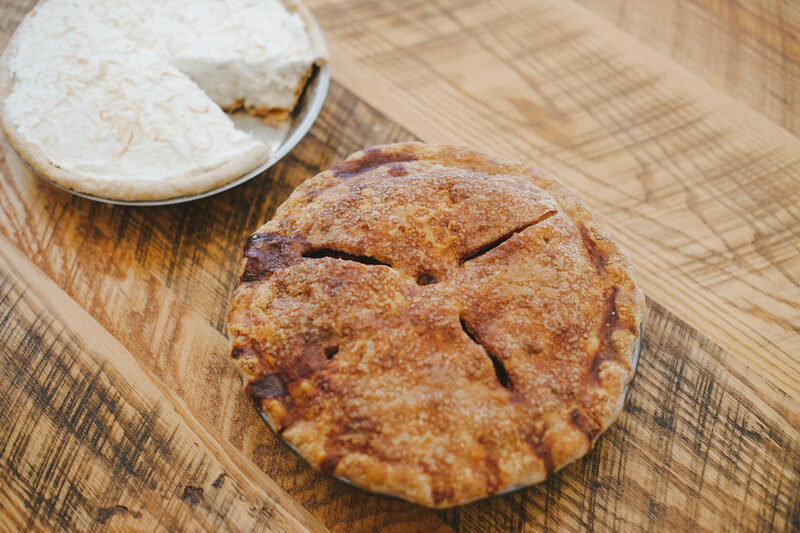 The Pie Chest offers both sweet and savory filling options, all tucked inside an all-butter crust. Pennington handles the sweet pies, and her counterpart, Zach Armstrong, handles the savory. 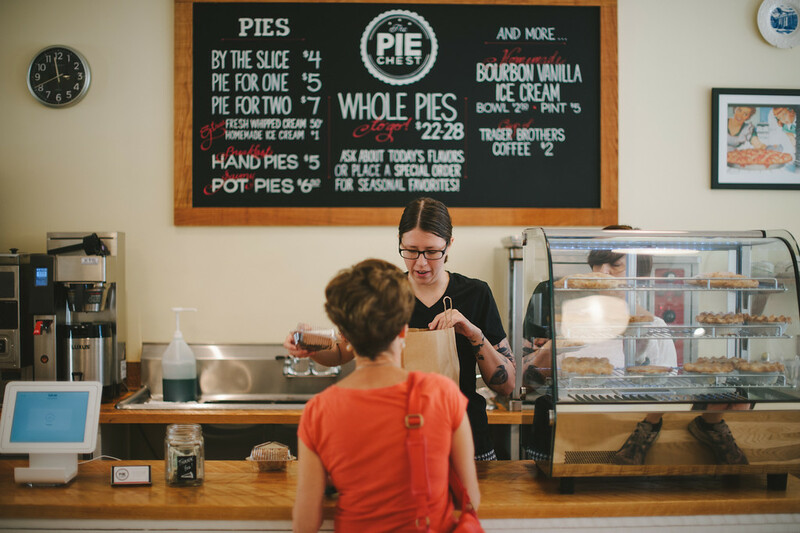 Customers can order by the slice or purchase a whole pie; there are small pies for two and even smaller pies for one. Want fresh whipped cream? Pie a la mode, with a scoop of bourbon vanilla ice cream? They’ve got you covered. Vegan and gluten-free options are available as well, at least one each day in savory and sweet. All pie options will change with the season, but a few pies—such as apple, lemon chess, whiskey chocolate chip, chocolate silk and peanut butter pie—will remain in the case all year long. Pennington prepares crust for small savory pies. Plus, it’s one of her personal favorites—Pennington herself isn’t a big fruit pie fan. She had a peanut butter pie on a chocolate cookie crust when she was a kid, and she has thought about it ever since. She doesn’t know who made the pie, or what it was made from; she just knows that it was delicious, and she loved it. It is that taste memory that she sought to replicate when she made the pie for her Whiskey Jar interview three years ago, and it is one of the first flavors she put in the case at the Pie Chest. Pennington packs up a few slices of pie for a customer. To see what’s in the Pie Chest’s case, check out their website or Facebook page. Or better yet, stop by the shop on 119 4th Street NE, Mon.-Thurs. 8 a.m. – 6 p.m. and Fri. – Sat. 8 a.m. – 8 p.m.